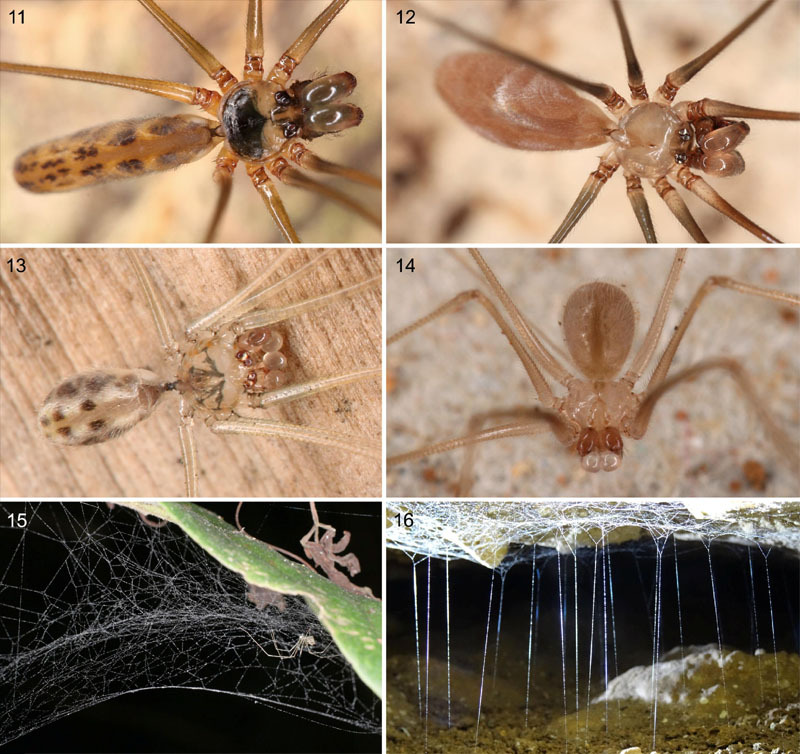 Pholcidae are ubiquitous spiders in tropical and subtropical caves around the globe. This paper provides a review based on a literature survey and unpublished information. A total of 473 native (i.e. non-introduced) species of Pholcidae have been collected in about 1000 caves. The large majority of cave-dwelling pholcids are not troglomorphic; only 86 troglomorphic species are known, including 21 eyeless species and 21 species with strongly reduced eyes. Most troglomorphic pholcids are representatives of only two genera: Anopsicus and Metagonia. Mexico is by far the richest country in terms of troglomorphic pholcids, followed by several islands and mainland SE Asia. Most troglomorphic pholcids belong to two subfamilies (Modisiminae, Pholcinae), very few belong to Smeringopinae and Arteminae, none to Ninetinae. This is in agreement with the recent finding that within Pholcidae microhabitat changes in general are concentrated in Modisiminae and Pholcinae. 11, 12. Two undescribed species of Uthina from Bali and Sulawesi; note smaller eyes and paler color in cave-dwelling (right) species. 13–14. Two undescribed species of Metagonia from Brazil; note evanescent eyes and pale coloration in cave-dwelling (right) species. 15–16. ‘Typical’ pholcid web of Metagonia bonaldoa (left; domed sheet with tumble lines above sheet), and unusual web of cave-dwelling Metagonia potiguar (right; sheet attached to rock surface and many vertical gum-foot lines).